With college basketball season finally over, many UT students have been left with busted brackets and shattered dreams (unless they’re Villanova fans.) 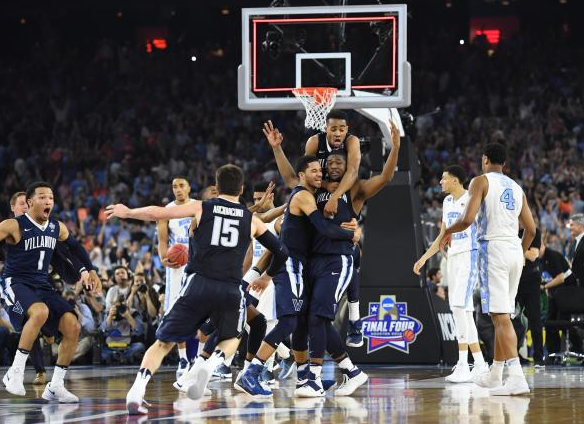 The term “busted bracket” refers to the failure of college basketball aficionados’ (or lack thereof) attempts at having a perfect March Madness bracket. In an NCAA.com story, some bracket experts, also known as bracketologists, see the possibility of having the perfect bracket as low as one in 9.2 quintillion. However, others such as Jeff Bergen, a mathematics professor at Depaul University say that there’s a one in 128 billion chance of success. Regardless, the chances of achieving this endeavor is next to impossible. One casualty in the quest for a perfect bracket is sophomore sport management major David Latrella who had Kansas taking home the National Championship. Unfortunately for Latrella, Kansas fell short as they faltered to Villanova in the Elite Eight 64-59 on March 26. Notably, the matchup that led to the immediate disposal of brackets into the trash was No. 2 seed Michigan State’s collapse against the hopeless No. 15 seed Middle Tennessee State University in the Round of 64. “If I could go back and change a prediction, I would change Michigan State making it to the finals,” Latrella said. Even though Michigan State busted Latrella’s bracket, he also had some good fortune as he selected Round of 64 upsets such as No. 11 seeds Wichita State and Northern Iowa over No. 6 seeds Arizona and Texas, respectively. In addition, he also penciled in No. 12 seed Arkansas-Little Rock over No. 5 seed Purdue in another Round of 64 upset. “It’s unfortunate that my bracket wasn’t perfect but there’s always next year,” Latrella said. Despite the fact Latrella and Sobotka decided to take risks in their NCAA Brackets, senior advertising and public relations major Corey Maino went the safer route in his bracket selection. His Final Four consisted of No. 1 seed Kansas versus No. 2 seed Oklahoma and No. 1 seed North Carolina against the aforementioned Michigan State. When Kansas lost to Villanova in the Elite Eight, Maino called it quits on his bracket. “I just thought Kansas was the best team and most consistent all season,” he said. Though his bracket wasn’t close to being perfect, the Syracuse fan was happy to see his team go all the way to the Final Four. “Syracuse’s run was incredible… It shows that if you’re in the Tournament, you never know what can happen.” The feisty No. 10 seeded Orange were eliminated by North Carolina 83-66 on Saturday night, but the March standouts had impressive come from behind victories over both Gonzaga and Virginia. In another NCAA.com piece by Davidson University math and computer science professor Tim Chartier, only four teams have won more than three games in the Tournament (2.3 percent) and only two teams have ever won four games in March Madness (4.5 percent). UT students are not the only ones to be victims of winning an almost impossible numbers game that March Madness brackets are defined as but it’s one that is almost too tempting to pass up for any sports junkie. Next March will most likely be just as crazy as the one before it and UT students will eat it right up just like the rest of nation.